KANSAS CITY, Mo. — Two former white supremacists delivered a message of change in Kansas City on Thursday after they were invited to speak by a woman who had two family members killed in the attack at the Jewish Community Center in Overland Park five years ago. Christian Picciolini and Shannon Martinez spoke as part of the SevenDays Make a Ripple, Change the World event. 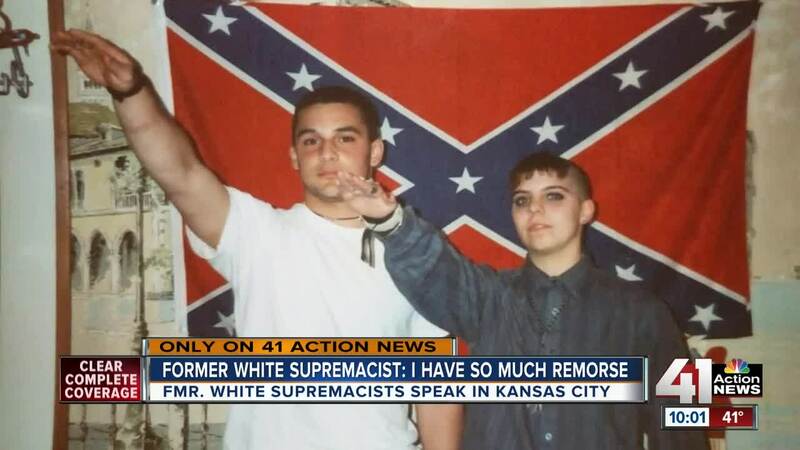 Picciolini told 41 Action News that he remembers fighting and hurting many people during his time as a white supremacist. Shannon Martinez recalled an incident where she was with a group that threw a can of tear gas into a gay nightclub, blocking one exit so no one could leave and then standing outside the only other exit ready to beat anyone who stumbled out of the building. Martinez said she doesn’t know if anyone ever died as a result of her actions over the years. "I never hung around long enough to find out," Martinez said. Picciolini and Martinez understand that some people will find it hard to trust them, but both say they live with regret. The pair were invited to speak in Kansas City to anyone willing to hear their story. But the person who invited them might surprise many. Mindy Corporon's son, Reat, and her father, William, were killed by a gunman five years ago at the Jewish Community Center. The man who killed them was a white supremacist. Corporon said she felt compelled to listen to their message after three people told her that she should consider their stories. "My whole body just cringes and I'm like, ‘ugh, I dont know,’” she said. She opened a web link that a board member for her nonprofit organization had sent her. What she learned changed her. Picciolini and Martinez shared their messages in Kansas City, closing with encouragement for others to be open to change. Picciolini said that for him, it's about meeting people and having an open heart. They are telling their stories of change in hopes of changing the world. For her part, Corporon hopes changing the world starts with a ripple of kindness. The SevenDays Make a Ripple, Change the World event is put on by Corporon’s Faith Always Wins Foundation. To learn more about the foundation and the event, visit the SevenDays website.